I’m not sure that you’ll find anything exactly like this Firecracker Chicken if you actually travel to China. No, this is definitely an Americanized version of Chinese stir-fry! It’s common on some popular Chinese take-out menus—and with good reason, because it’s delicious. The sauce bakes down into a glaze, and the resulting dish is a little crispy and a little sticky, a litte spicy and a little sweet. It’s in the same family as a sweet and sour chicken, but with more of a kick to it, thanks to the buffalo sauce. If you cook a lot, it might seem odd to bread the chicken in cornstarch and egg, and then add it straight to the skillet with no outer breading layer on the chicken. But this mix of egg and cornstarch makes a crust on the chicken that will both thicken the sauce and help it stick to the chicken. Once you lightly fry the chicken pieces in your skillet, the rest of the recipe is as easy as tossing the chicken pieces in the sauce and baking them until they are cooked through and the sauce is beautifully thickened. You can use either chicken breasts or chicken thighs for this dish. Serve it over cooked rice or salad greens. It’s a winner for sure and about as easy as Chinese take-out can get at home. Enjoy! 1 Preheat the oven to 400°F and prep the sauce. Stir together the sauce ingredients in a medium bowl and set aside. 2 Prep the chicken: In a bowl or large plastic bag, combine the cornstarch, salt, and pepper. Add chicken and toss to coat well. Whisk together the eggs in a medium mixing bowl. Line a plate with paper towels. Arrange everything near your stove. 3 Fry the chicken on the stovetop: In a large, deep skillet or wok, warm the vegetable oil over medium-high heat until a flick of water sizzles on contact. As soon as the oil is hot, transfer the coated chicken to the bowl with the eggs and toss to coat well. Scoop out the chicken pieces with a slotted spoon, allowing any excess egg to drain off, and transfer the chicken to the skillet in an even layer. Cook for about 3 minutes per side until a crust forms and the chicken is a light tan color. The chicken will not be cooked through at this point. 4 Sauce the chicken: When chicken is done, remove it from the skillet with a slotted spoon and transfer it to the plate lined with paper towels to drain off any excess oil. Transfer to a 9x13 baking dish. Add sauce and toss to combine. 5 Bake the chicken: Bake chicken for 25 to 30 minutes, stirring halfway through to ensure even cooking. When the chicken is done, it should be cooked through and the sauce will thicken and turn into a glaze coating the chicken. 6 Serve: Serve chicken with cooked rice garnished with scallions. Hello! All photos and content are copyright protected. Please do not use our photos without prior written permission. If you wish to republish this recipe, please rewrite the recipe in your own unique words and link back to Firecracker Chicken on Simply Recipes. Thank you! Can i use something other than eggs. Hey Thomas, I haven’t tried with anything but eggs. You could use an egg substitute for sure, or you could try it with a more standard breading like coating in buttermilk and then a light dusting in cornstarch. That might work just as well. Egg is definitely the classic preparation though so I’m not sure if there is a perfect substitute in this case. Good luck! *PERFECT*! Exactly the recipe I’ve been searching for. A few local restaurants make this with shrimp, and I think they may add a little mayo to the sauce (as its a little creamy), so I may try that in the future. I made this, subbing shrimp for the chicken, adding a bit of sriracha to the sauce, and it came out delicious–every bit as good as the restaurants! The sauce thickened up beautifully. Thanks for posting! I have made this a few times and it has always been a roaring success. However I have just realised reading through the other reviews that I should have been using Franks Buffalo sauce and not Franks hot sauce, I didn’t realise there was a difference and am not positive that it is available here in Ireland, like red pepper flakes, which are not available anywhere in Europe that I have looked. Anyway, works out fantastic – sweet and spicy. Absolutely delicious. Made it exactly like written. Chicken was moist and tender. It was a hit. Served with rice and some homemade baked shrimp egg rolls. Great Sunday dinner. We love this recipe.making for 3rd time.delish!!! Awesome dish! It tastes like General Tso’s chicken or maybe a spicy sweet and sour. I cooked it according to the directions exactly and didn’t add a thing. It came out perfect. This dish will be a staple in my house going forward. It was easy to make and the sauce was so tasty. Better than the restaurant version. Also being gluten-free was a huge plus! Loved it and will make it a part of my permanent go to recipe file! Thanks for sharing this amazing dish! Tried this on Monday night and OMG, a keeper for sure! Stayed true to the recipe this time. I used a combination of Crystal Louisiana hot sauce and Sweet Baby Rays Buffalo Sauce. It took a tad longer than the stated 45 minutes, but oh well, totally worth it. Served it with Jasmine Rice and there were no leftovers between 3 people.The only thing I will do different next time is make 1-1/2 batches of the sauce as 1 batch was not enough for 1-1/2 pounds of chicken pieces, and will most definitely bump up the heat! Is there something to replace the buffalo sauce? I cannot find it at the market. What might work instead? You could use a thicker hot sauce, like Franks or maybe even a spicy BBQ sauce. Good luck! If you have the urge to go to Panda Express, don’t do it. Stay home and make this instead. It’s better. And very simple. 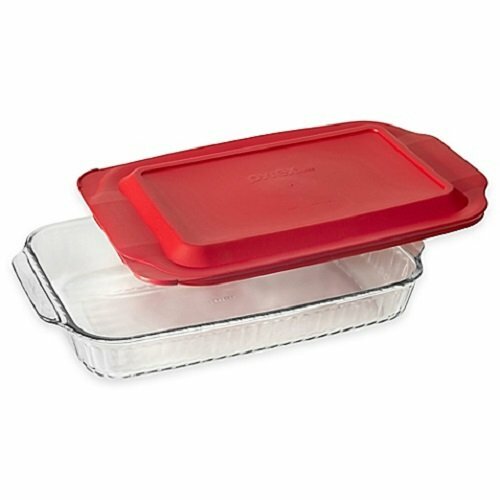 One tip, line your baking dish with foil. I waited till the next day to cleanup and it wasn’t easy. Glad you liked it Greg! I sprayed mine with just a little cooking spray so the chicken wouldn’t stick. There wasn’t any sauce to clean up, however, because my kids used their fingers to lick the sauce out of the pan! I’ve been making something similar to this for years — who knew it was Firecracker Chicken? It’s great, one of my favorite meals. The biggest thing I do differently is with the rice. For each cup of rice I add a clove of garlic, minced; half of an onion, diced; half cup each of diced carrots and red bell peppers and cook as usual. When the rice is done cooking I add half a cup of frozen peas and let it set for at least 5 minutes.